Do you know how many wines will be presented at the Vancouver International Wine Festival 2017 Tasting Room? Around 800. Picking wines you really would like to try in your 3 hours of wine tasting would be like finding a needle in a haystack. I had a chance to try some of the wines that you can find at the Festival, and picked 9 for you; 9 needles from the haystack. I am guessing that all of these wines will be available in the Festival Tasting Room, as I do not have a list of wines that will be presented, but keep your fingers crossed and come visit these winery tables. Below I’ve listed the wineries, the winery principal you can meet, and the wine I recommend you to try, along with my brief tasting notes. All the wines I rate at 4.5 stars out of 5 stars. Enjoy. Thank you to the Festival for providing the background information on each winery principal that you see below. Glenn Fawcett, President – Glenn is responsible for running the business and sales and marketing ends of Black Hills. As an entrepreneur, he was involved in running high-end wine tours of the Okanagan before joining Black Hills. Prior to that, he was president and owner of Bust Loose Holidays, one of Canada’s most successful tour companies for university and college students. Nota Bene 2014 – Deep garnet colour. Medium nose with dark, ripe fruit, cherries and vanilla with a hint of capsicum. Fuller body, round ripe black fruit and sweet spices. Flavour expands as you swirl. A hint of chocolate as well. years. 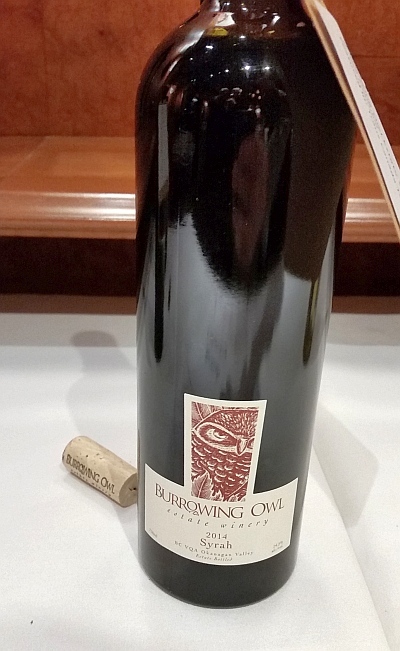 A certified wine educator, Howard was the first BC winemaker to release a series of single vineyard designated wines, the first to produce a Super Tuscan blend and the first to receive Red, White and Winery of the Year at the Canadian Wine Awards. Viognier Small Lots Viognier 2015 – Very aromatic; lychee and lime aromas. Medium plus body, silky, mineral, with lime and lychee flavours. Very tasty. Chris Wyse, Owner/Proprietor – Chris joined the family business in 2006 and assumed the president’s role in 2007. The oldest son of founders Jim and Maggie Wyse, Chris brings astute business skills to the company with a degree in entrepreneurial business management and a career in real estate that included development analysis and mortgage finance. Syrah 2014 – Deep garnet colour. Light vanilla, sweet spices and red fruit on the nose. Round, medium plus body, with a tannic backbone. Ripe red and black fruit. A balanced wine. Marco Piccoli, Winemaker – Marco worked in Italy, Germany and Argentina, gaining valuable experience in both the Northern and Southern hemispheres. He earned a Master’s Degree in Grape Growing and Winemaking from the University of Udine and the University of Applied Science in Wiesbaden-Geisenheim. Marco interned at the Inniskillin Niagara Estate Winery and in 2005 became a winemaker at Jackson-Triggs Niagara Estate. Grand Reserve Entourage Brut 2013 – this sparkling wine has a bright citrus and stone fruit nose. Medium minus body, dry, with light dancing bubbles initially on your tongue that leads to creaminess than tart acidity. Apple flavours with light bitterness on the finish. Very good quality. President of Sales and heads all export and sales divisions. As a pioneer in the international export of Canadian wine, his friends have dubbed him, “the king of export.” Charlie is the youngest child of Gary and Lena, the winery’s founders and owners. Cabernet Franc 2013 – Quite aromatic. Capsicum, red fruit and vanilla aromas. Dry, medium plus body. Round mouth-feel but does have a hard edge to it. Vanilla, red fruit and red cherries. Capsicum & cedar behind the fruit flavours. Quality. Carl Sparkes, Owner – Carl and Donna Sparkes founded Devonian Coast Wineries in 2011, purchased two established wineries, Jost and Gaspereau Vineyards, and soon began planning for a third. Devonian Coast Wineries unites their love of wine and of Atlantic Canada, while bringing fresh ideas and commitment to elevating Nova Scotia’s expanding wine industry. Jost Tidal Bay 2015 – Very aromatic; mixed green, herbal and stone fruit aromas. Dry, medium plus acidity, but not overpowering. Pine needles flavour mainly but also stone fruit. Very much reminds of me of Argentinean Torrontes. This wine was a 4/5 stars, but very interesting, so I included it for you to try. Alex Griffiths, Export Director – Alec Griffiths was born in Uruguay. The early part of his career in the wine industry saw Alec working for some of the largest wine brands from Chile and Argentina. 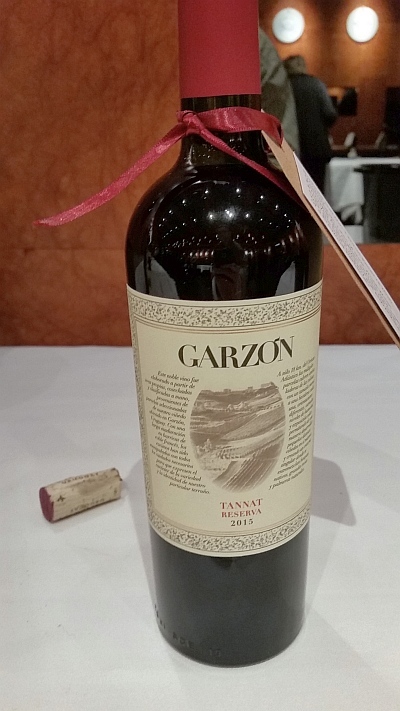 As a native Uruguayan, he never dreamed he would return home to join the team for a state-of-the-art winery such as Bodega Garzon. Tannat Reserva 2015 – Inky black ruby in colour. Dark fruit, meat and pencil leads aromas. Fuller body, dry and round with medium plus tannins. Ripe dark fruit flavours. A very nice wine that would be great with a steak. Charles Bouthillier, – was named Canada Division Manager for Ste Michelle Wine Estates in 2014. Before joining Ste Michelle Wine Estates, Charles was the Director of Business Development across Canada for Treasury Wine Estates. His experience in the wine industry began in 1998 as a wine consultant for the SAQ, one of the world’s largest wine buyers. H3 Chardonnay 2013 – Bright, medium minus lemon colour. Light vanilla pod, tropical fruit, apple and sweet spice notes on the nose. Medium plus body, silky, round, dry and very fruity. Tropical fruit, with light sweet spice. Very nice. Justin Fairweather, Export Sales Director & Managing Director – After years travelling the world studying wine-making across Australia, Italy, France and Moldova, AB&D’s founding winemaker Justin Lane returned to McLaren Vale with a unique and enterprising premise – creating an “Alphabet of Wine”. Forming Alpha Box & Dice as a laboratory for viticultural exploration in 2008, the team set upon constructing a different wine style to represent every letter of the alphabet. 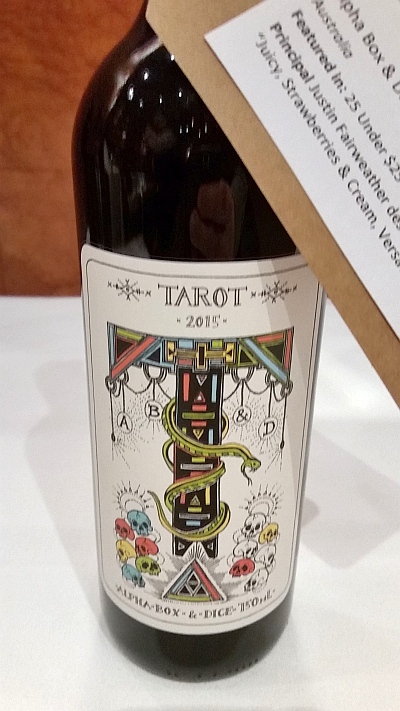 Tarot Grenache 2015 – Pale garnet colour. Light orange, flowers and red fruit aromas. Dry, salty minerality and red fruit. Some pepperiness on the finish. This wine was the most exciting for me at this tasting. Pato Reich, Director – has a degree in commercial engineering from the Adolfo Ibanez University in Chile and a Master’s Degree in Finance from Emory University in Atlanta, Georgia. From 2003 until 2006, Patricio worked in the treasurer department of Santander Bank, where he developed custom-made financial solutions for corporate clients. Currently he is in charge of marketing and Sales for Bodega Renacer. 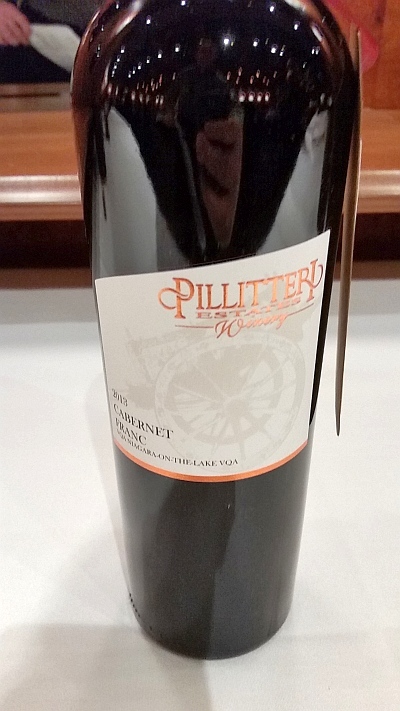 Punto Final Malbec 2015 – Light black cherry aroma. Full body, dry and round. This wine also has an interesting chalkiness to it on the palate. Ripe, black fruit and vanilla. Mouth filling flavour. Fine tannins.